Baby boomers can we become the nu groovy and have a wonderful future? My new e pac, and convertible bag and nylon fold up bag. I purchased new travel gear for my Italy trip, a back pack and a convertible bag and a purse. I also took a nylon bag that packs into its own pocket just in case. It took a long time to decide on what to buy but I ended up with an epac by Heys. It is beyond belief small, well for me anyway. Something that is nice is it front loads with several compartments. I got buyers remorse almost right away and couldn’t sleep until I made the decision to take it back the next day. However when I awoke and looked at it again, went over why I chose it originally and my espouse pointed out that I just needed to get more locks for when I want to check it…I kept it. I probably would not have chosen pink but it was on sale and in stock and I am now thinking that it is kind of nice and may even stand out in a sea of black suitcases. You see we are taking a train from the Rome airport to our apartment in Trastevere and back at the end of our trip. I will also be taking the train around Italy although I probably will leave this in Rome and just take the convertible. I am not sure yet. I was also thinking about the future because I want to do more train travel around Europe and there will come a time when I won’t be able to leave it behind and I need my portable office. I have so many suitcases that I have purchased over the years that I didn’t want to make a mistake. I have it packed now and am very happy with it. If it was any larger I would not be able to pick it up. 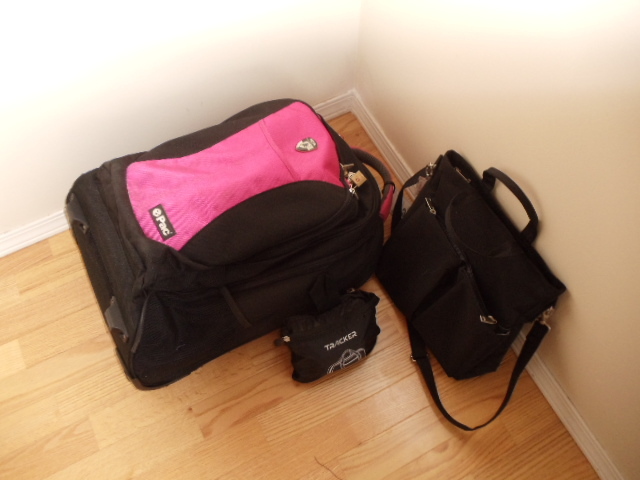 I will be able to take the convertible and my purse on board and there is enough room left for stuffing them both inside the epac after collecting it from checked luggage. I planned on using the wheels unless I was getting on and off a train or dragging it over cobbles. We are walking a short distance coming and going to the train. The convertible is a smaller bag than I am accustomed to using as a carry on but between it and the purse it seems to be holding everything I will need on board. I will use it as my day pack and while travelling around. 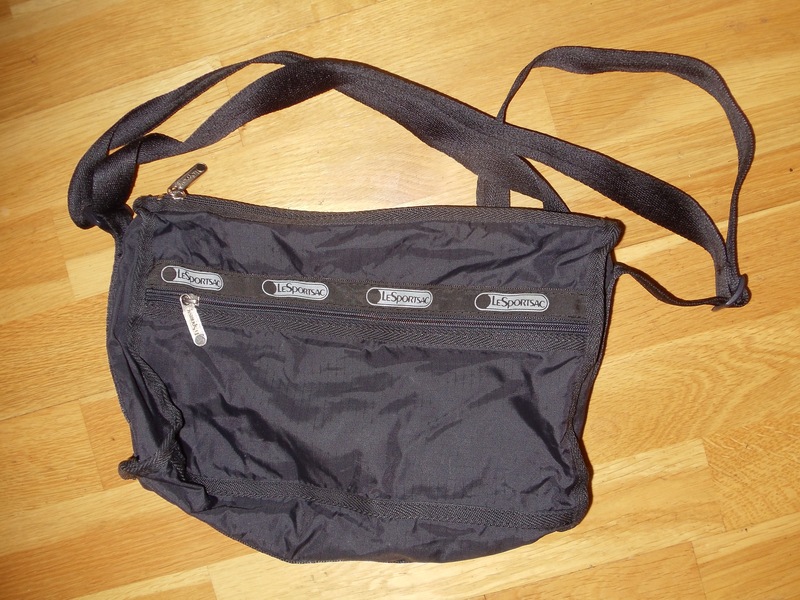 It folds down into a small space when not using it and it converts from back to messenger bag to handle so it is really versatile. The purse I picked up for .50 cents at a recycling place here in town. It washed up nicely so I am happy with that purchase. my .50c new-used travel purse. All and all I am pretty happy with my new travel gear. It worked and weighed in at an incredibly low 12.5 Kg I am glad that I went with it and it will be good for future train travel. It really forces me to take less (a very good thing) The only thing is it may be too small if one was going to a winter climate unless you wear your sweater and coat. I ended up using my purse as a day bag and the nylon fold up as my overnight on short trips. I packed the purse in the checked epac rather than take it on board. I am going for 10 kg next trip…wish me luck! This entry was posted in Italy, Travel, travel gear and tagged Backpack, Baggage, Italy, Rome, Suitcase, Trastevere, travel, travel gear. Bookmark the permalink. They have good food in Italy. Piazza Santa Maria in Trastevere and mass at the basilica.